Notes: There have been two Britannia stations in England: one, a halt on the Kingswear branch in Devon, and the other in Lancashire. Britannia (Lancashire) is a short distance north-west of the summit of the Rochdale to Bacup railway where it reached 967ft, the highest elevation on the Lancashire & Yorkshire system as it crossed the watershed between the Spodden and Irwell valleys. Britannia station was just 5ft lower than the summit. The lineside scenery of rough pasture and moorland at Britainnia is in contrast to the constricted valley setting of most other stations on the two branches to Bacup. The station served a straggling village on the Rochdale-Bacup road, taking its name from an inn. Lancashire seems to have specialised in stations named after hostelries, with Nelson, Waterloo, Cherry Tree, Clock Face, White Bear, Boar’s Head, Old Roan, Old Swan, and Bay Horse sharing this etymology. Britannia’s origins and economy were based on the huge quarries on the nearby moors. The road accompanying the railway line from Britannia to Bacup road has the unusual name ‘New Line’. This name, still in use today, commemorates the opening of the ‘new’ Facit-Bacup railway in 1881. Unlike the neighbouring double-track roadside stations at Facit and Shawforth, Britannia was given an island platform in a cutting; Wray (2004) remarks that it was ‘quite elaborate for a station in a relatively remote location’. The booking hall was on the east side of an over-line bridge, and a stone staircase led down to the flagstone platform which was sheltered by a verandah for over half of its length. 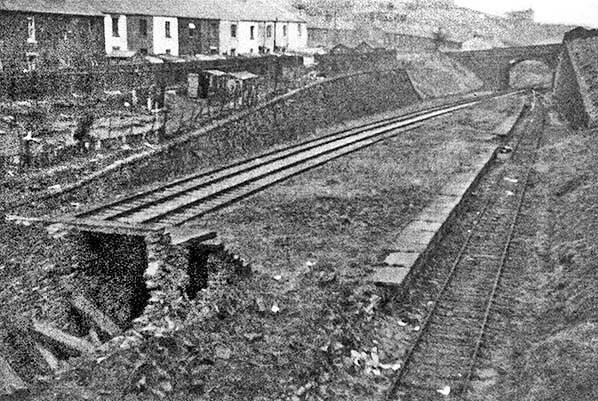 Details of the platform buildings have not been, but Marshall (1970) notes that the platform buildings at Britannia station were similar to those at Bacup. Since the glazed roofing provided at the neighbouring 1881 Bacup and Shawforth stations and on Facit’s down platform building was of a ridge-and-furrow design, it would follow that Britannia, being contemporary with them, would have had the same style. No photographs are known to exist of the station when open. 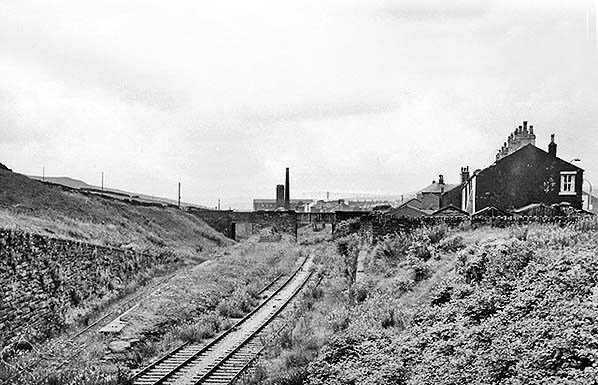 The steep gradients on the railway either side of Britannia station ruled out its use by goods trains except in isolated instances, Bacup’s goods trains reaching the town via the Irwell Valley route. It is no surprise, therefore, that Britannia had no goods facilities. On the other hand, stone traffic from the extensive Britannia Quarries was of considerable importance and it had a downhill journey from the summit of the line. A long loop extended on the up side from the east end of the platform to a short distance beyond the west end. A connection from this loop crossed both of the running lines and then ascended a steep incline to exchange sidings (‘Britannia Stone Siding’) at the top of the cutting. From these sidings a standard gauge line crossed the moor in a long curve to serve the Britannia Quarries. These sandstone quarries opened circa 1885. They were owned, as was Britannia Stone Siding, by Messrs Brooks & Brooks, later Butterworth & Brooks. 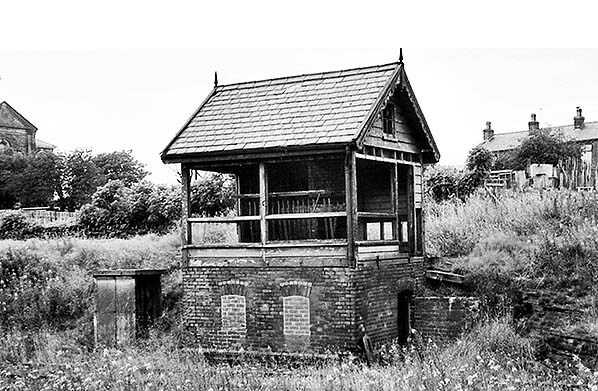 Britannia signal box was on the up (north) side, opposite the connection to the stone sidings at the west end of the station. A Gloucester Wagon Co structure, it was constructed with the line in 1881 and was fitted with a 19-lever frame. In its early years, Britannia officially possessed an engine shed. Until 1892 the signal box close to the shed just south-east of Bacup was Britannia Engine Shed (and the nearby tunnel was known as Britannia – or New Line – Tunnel), but in that year the cabin, more properly, became ‘Bacup Engine Shed’. Between Britannia and Bacup the Facit Branch had one of the steepest gradients on the British ‘main line’ network, most of it at 1 in 34 / 1 in 35, interrupted by a less severe 1 in 70 through the short Britannia, or New Line, Tunnel. The descent began just south-east of Britannia station which was on a shallow gradient of 1 in 260 (or 193 according to the gradient post), steepening to 1 in 61 just beyond the platform. This heroically named station was one of those considered unimportant enough to close as a ‘wartime economy’ in 1917 to release railway staff for war service. Since 1911 the electric tramway route between Rochdale and Bacup had passed close by the station and offered more convenient and frequent services to both towns; at both Bacup and Rochdale the stations were poorly placed to serve the town centres. Bradshaw of July 1922 still included Britannia in the Facit Branch timetable, but with no trains calling. A petition to reopen the station was received by the London, Midland & Scottish Railway (successor to the LYR) in 1926 from the Deansgreave Manufacturing Co Ltd at Britannia Mill, along with the Britannia Mill Co and Messrs Heys & Co, but the decision was made not to reopen it. After the station’s closure was confirmed by the LMS the buildings on the platform and the booking hall adjacent to the road bridge were removed, but until the early 1960s the derelict platform survived, latterly with its edge stones on the northern face removed and with the partially dismantled staircase in place. In 1939 plans were made to remodel the layout at Britannia. The reason is not clear, but Littleworth (2014) suggests that it might have been because the curvature of the track past the old platform caused loading gauge or operational difficulties – with support from the 1937 Sectional Appendix where a speed restriction of 25mph ‘over the curve at Britannia’ is indicated. Consequently on three consecutive Sundays, 17, 24 and 31 August 1941 the remodelling took place, whereby the down line was demoted to a loop siding, the up platform line became the down line and the up loop became the up line. 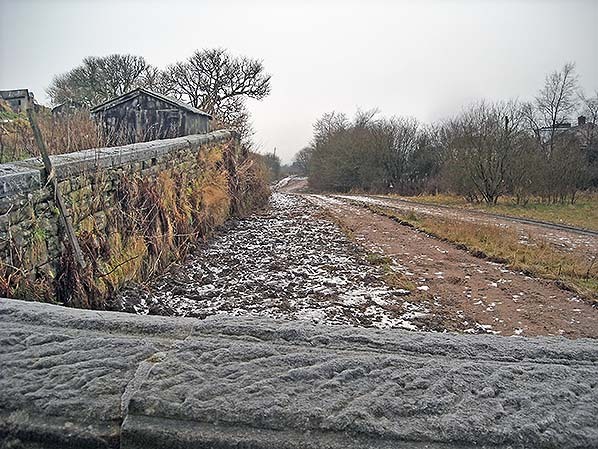 It was perhaps at this time that the edge stones on the north face of the derelict platform were removed as a safety measure, allowing more clearance and avoiding the risk of them slipping from the platform onto the track as the structure deteriorated. Britannia Stone Siding closed in 1944 and the former down line, already demoted to a siding, is thought to have been abandoned after this time, though it was not lifted until the 1960s. After the Rochdale–Bacup passenger train service was suspended in 1947 and abandoned in 1949 traffic through Britannia was limited to light engine workings to and from Bacup loco shed, and the railway between Facit and Bacup shed was closed entirely on 5 May 1952. The signal box closed sometime between January and June 1949. The rails through Britannia were left in place in case they were needed for wagon storage. Fortunately for posterity, Ian G Holt took a series of photographs at Britannia on 17 August 1961 which he has kindly allowed to be included. His pictures reveal that the station platform and signal box were still in place and that both ‘main line’ tracks and the loop line were in situ. The signal box was demolished in 1962/63. 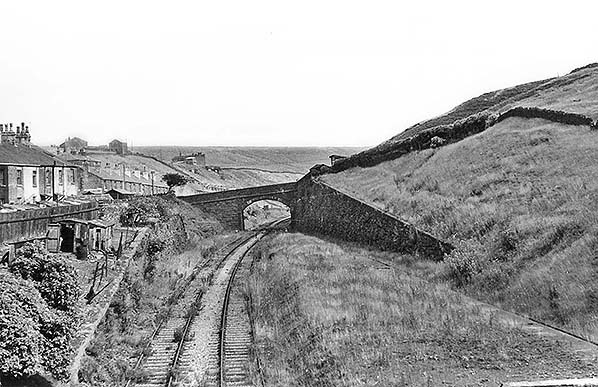 The wagon storage status of the Facit-Bacup line ended on 12 August 1963 and the rails were removed by the end of 1964. When the prolific photographer of stations, John Mann, visited in late 1971 the platform was still substantially intact. 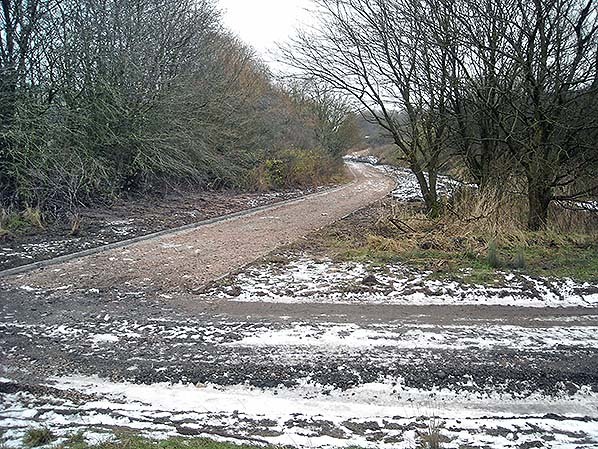 However, today nothing can be seen today of Britannia station as its site and the cutting towards the summit have been filled in and landscaped, and a recreational path follows the line of the old railway. Since the line closed the tunnel between Britannia and Bacup been sealed off, but it was used at one time for storing fencing materials. Whereas up trains were allowed 3 minutes for the journey from Shawforth to Facit, the next station southward, in the opposite direction the time was 5 minutes as they faced the punishing uphill 1 in 39 gradient for most of the 1¼ miles between the stations. At some stage, probably shortly after the war, a buffer stop had been installed on the south side of the subway overbridge on the siding giving access to the coal yard on the north-east side. This effectively stopped use of the coal yard; it could have been installed after Shawforth station signal box ceased to be a block post. It is possible that defects had appeared in the bridge over the subway, making it necessary to cut off the coal yard. Shawforth station lost its passenger services when they were suspended by the LMS during a ‘coal crisis’ in June 1947. By this time the coal traffic handled here had declined significantly. In this somnolent state, Shawforth passed into British Railways’ London Midland Region, under whose administration the closure was declared permanent in December 1949. Whilst the other Facit Branch stations continued to handle goods and mineral traffic after closure to passengers in 1947/49, Shawforth did not. Because of the steepness of the gradients goods traffic worked through Shawforth and Britannia only in exceptional circumstances and goods traffic from Bacup worked via the Irwell Valley route. From June 1947 the line on which Shawforth station stood saw only light engine operations between Facit and Bacup engine shed, but it was closed to all traffic on 5 May 1952. Thereafter the track remained in place, notionally for wagon storage, but there is no record of the line ever being used for this purpose, and the rails had been lifted by the end of 1964. 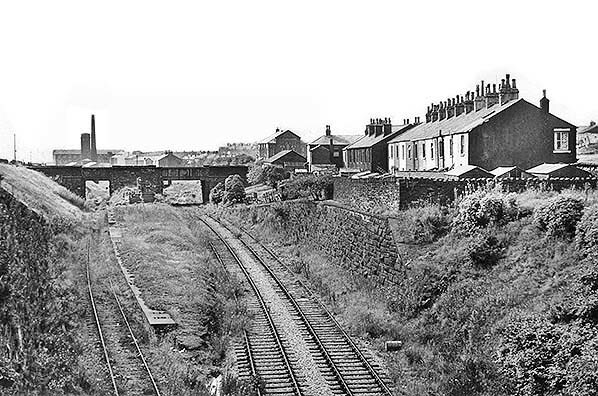 Before the rails were removed a housing development called Knowsley Crescent began to advance from the north and west towards the decaying remains of Shawforth station. Once the rails disappeared and the station was demolished Knowsley Crescent spread across the station site on its high embankment. A practical solution for pedestrians wishing to reach Knowsley Crescent, at its much higher elevation, from Quarry Street was found by retaining the old station subway. The walled entrance to the subway on Knowsley Crescent makes a most unusual contribution to the townscape. A stone tablet in the subway commemorates the inauguration of ‘Shawforth Station Redevelopment Scheme’ on Tuesday 28 April 1966. The OS 1: 2,500 map of 1968 shows the housing development on the site of Shawforth station to be complete. 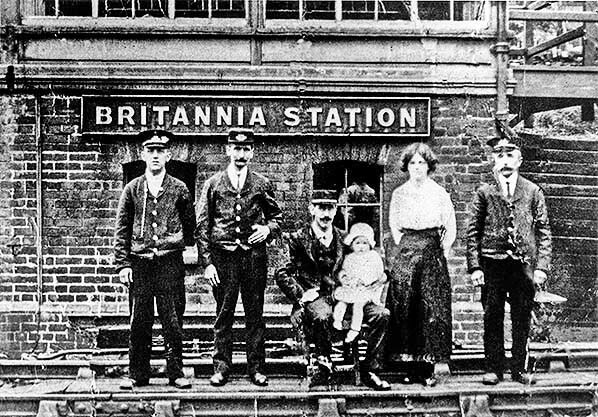 Only the signal box at Britannia appears to have been photographed before the station closed in 1917. Its position is about 50yd west of the station, on the up side of the tracks. Commenting on this photograph, Jeffrey Wells (1993) suggests that it dates from World War 1, and he draws attention to the severed arm of the man on the left as well as to the confidence of the party that no train is due since they are standing and seated on the up line. It would be interesting to know the identity of the four railwaymen, the woman and the child. 1910 1: 2,500 OS map. Uniquely among the intermediate stations on the Facit Branch, Britannia had an island platform. The booking hall is shown east of the road overbridge, and the shaded area includes the staircase (covered?) down to the platform and the awning which extended about half the length of the platform is shown by pecked lines. The small buildings beneath the awning are also marked. Sidings are located to the west on the down side (south of the running lines) and a standard gauge tramway extends southwards off the map to serve some small coal pits and the Britannia Quarries. The signal box is identified between the two overbridges west of the platform. Some of the neighbouring terraces are shown to be ‘back-to-back’, including the cluster on Market Street close to the bridge at the east end of Britannia station. The road south of Beulah Chapel is called ‘New Line’, referring to the adjacent railway: it was ‘new’ in comparison to the Irwell Valley route to Bacup and the Rochdale-Facit section. The village of Britannia, named after an inn, includes scattered terraces and two Methodist churches. Unless they were employed in the mills, many of the men of the village will have trekked uphill to work in the quarries or pits each day. In the year after this map was published a street tramway, connecting Rochdale and Bacup, was opened and it followed Market Street immediately north of Britannia station. Click here for a larger version. 1939 1: 2,500 OS map. Although Britannia station is labelled ‘Disused’ the booking hall and the buildings and awnings on the platform are still shown – there is even an extra building on the platform that was not shown on the 1910 map. The sidings west of the station are unchanged since 1910. The electric tramway along Market Street connects Rochdale and Bacup: it had closed in 1932. 1960 1: 2,500 OS map. The survey probably dates from the mid 1950s. The railway is now shown to be disused and sidings have been removed. Britannia station’s platform is shown but the northern (up) face has lost its edge stones as a slope is shown rather than a crisp edge: photo evidence confirms that this had happened. A fragment of the staircase is the only other structure surviving at the station. On the moors beyond this map extract to the west and south some quarries have now closed and are being used for disposal of refuse. Click here for a larger version. 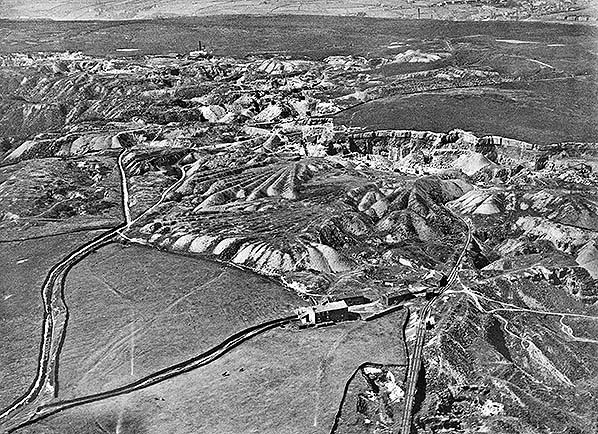 An oblique aerial photograph from August 1926 of the Facit and Britannia quarries on the moor top west of the Facit Branch. North-west is at the top of the photograph. A mineral line is seen entering the photo at the bottom, whilst the line connecting the quarries to Britannia station is visible as the dark line curving, then running straight to leave the image below the top right corner. This is a rare photograph of a passenger train working the Facit Branch before it closed. 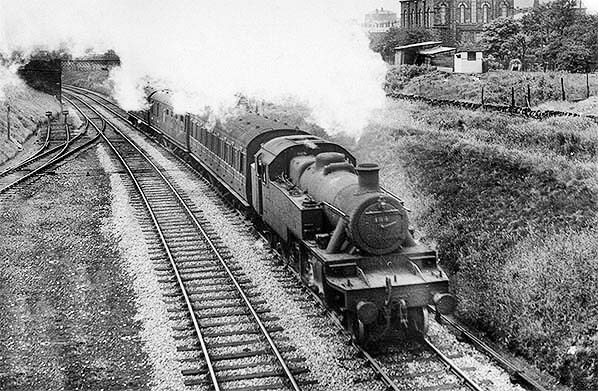 It was taken in June 1947, the month in which passenger services were withdrawn from the line. LMS No.194,a Stanier 2-6-2T, is hauling a 3-coach train from Bacup and is about to pass the disused station at Britannia; the view is from the bridge from which the station, directly behind the photographer, was entered. The same train was photographed by W A Camwell crossing Healey Dell Viaduct south of Shawclough & Healey station. Beulah Methodist church is the prominent building in the background. Bacup shed had a small allocation of these Stanier 2-6-2T locomotives for use on the line; when passenger services finished they were moved away, largely to Southport. The loco was classified 3P, meaning Class 3 Passenger. Withdrawals began quite early and the class became extinct during 1962 and none survived. No.194 became BR No.40194 and lasted until October 1961 when withdrawn from 27C, Southport shed. In July 1962 she was cut up by the Central Wagon Co, Ince, Wigan. Click here to compare this view with the same view today. The single island platform at Britannia is seen in 1956, looking east. The station closed in 1917. Part of the stone staircase leading down from the bridge is still in place. By this time the railway track on the right (the original down line) has been abandoned, and the up line on the opposite face of the platform has been reclassified as the down line, its neighbouring loop becoming the up line. The headshunt and connection with the new up line can be seen beneath the bridge beyond the platform. The edge stones have been removed adjacent to the new up line in case they were to fall onto the track from the derelict platform. Officially both of the tracks to the left have been closed since 1952, but for a further 11 years they would be retained in case they were needed for wagon storage. The signal box at Britannia closed in 1949 and is photographed here c1956. The structure was erected in 1881 and is a size 1 Gloucester Wagon Co design. At the time of the photograph the levers are still in place. The box was demolished in 1962/63. Looking west from Old Lane bridge at the island platform of the long-closed Britannia station in August 1961. The down (left) side of the platform is intact but, owing to the removal of the edge stones on the opposite side, that part of the platform is degraded. Vegetation has colonised the platform and is also engulfing the tracks. At the far end of the platform a lamp standard is still in place. The lower part of the staircase up to the site of the booking hall can be seen in the distance. The booking hall was at road level, but no evidence can be seen of it as the parapet now extends between the two bridges where it was located. The up and down lines and the down side loop are all still in place; the down line (left of the platform) was abandoned in 1944 and the other two lines were reclassified, so the up main line became the ‘down’ and the loop became the ‘up’ line. The building on the skyline beyond the left bridge is Britannia cotton mill, still in use by a textiles firm. The Classical building with the prominent pediment is Beulah Methodist church, now converted into apartments. 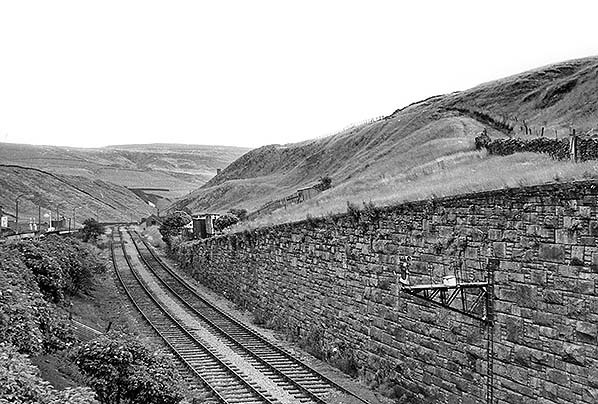 Looking south-east from Old Lane bridge towards the 967ft summit of the Rochdale–Bacup line in August 1961. The platform of Britannia station is behind the camera. The summit – the highest point on the entire Lancashire & Yorkshire Railway – is close to the platelayers’ hut on the down (right hand) side of the line beyond the lowest level of the retaining wall. At that point the rising gradient of 1 in 193 abruptly changes to a falling gradient of 1 in 40: the LYR gradient diagram states 1 in 250, but the sign still in place in 1961 reads 1 in 193. Rochdale Road and Shore Service Station (still operating in 2016) are seen to the left. The photograph was taken in August 1961. Click here to compare this view with the same view today. In August 1963 the scene at Britannia is little changed from two years earlier when Ian Holt took a series of photographs here. This view is westward from Old Lane, and the overgrown island platform of Britannia station is flanked by two lines on the up side and single line on the down side; it is understood that officially the nearest track, formerly the up loop, was reclassified as the up (main), and its neighbour, formally the up main became the down line in 1944, and that the far track – formerly the down line- was abandoned. As seen here in 1963 the rails were left in place after official closure in 1952 to be used, if needed, for wagon storage. The edge stones have been removed from the near side of the platform resulting in the collapse of the backfill, but the opposite side is largely intact. At the far end of the platform are the remains of the staircase which led up to the booking hall, long since demolished, at bridge level. The large building in the distance is Britannia Mill. 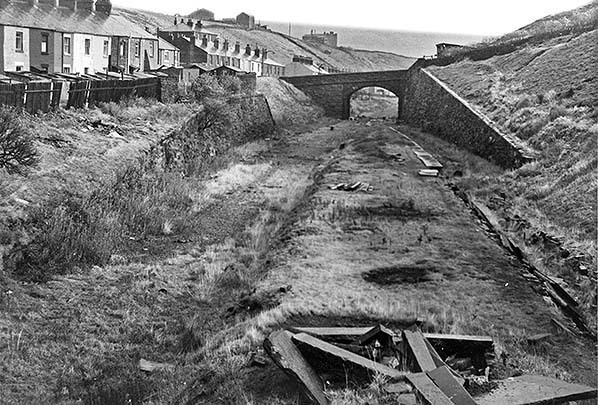 Looking east across the remains of Britannia station towards Old Lane bridge in September 1971. Passenger trains used this line between Rochdale and Bacup until 1947, but Britannia station closed in 1917 as an economy measure during World War 1; a request in 1926 by local firms for it to be reopened was unsuccessful. The rails were removed by the end of 1964 having been left in place for 12 years after the line was closed. The overgrown island platform is still clearly visible, but the removal of its edge stones has caused it to degrade. The pile of huge stones in the foreground is likely to be the edge stones. The photographer is standing on the overbridge at the site of the station’s booking hall, and a flight of steps formerly descended to the platform, where there were further buildings and a large canopy which extended for almost half the length of the platform. From this viewpoint nothing can be seen of the station today (2016) as the cutting has been filled in. Looking east from the former bridge at Britannia in January 2016 the viewpoint is similar to John Mann’s view of September 1971 above. The cutting has been filled in, the remains of Britannia station have been buried and for some years a path has followed the line of the railway. cutting is on the left.